Some users are just enjoying the newly released Intel Haswell K Series, a.k.a Devil’s Canyon. But a few months from now, the 5th Generation Intel Broadwell-K unlock series will be released. A leaked roadmap published by VR Zone shows that the Broadwell-K or unlock processors will be released sometime in Q2 of 2015. The Broadwell-K processors are fully compatible with the new Intel 9 Series Z97 motherboards with socket LGA 1150. See more details below. According to the desktop platform consumer roadmap above, the Intel Broadwell-K series or unlock processors will be released by Q2 of 2015. 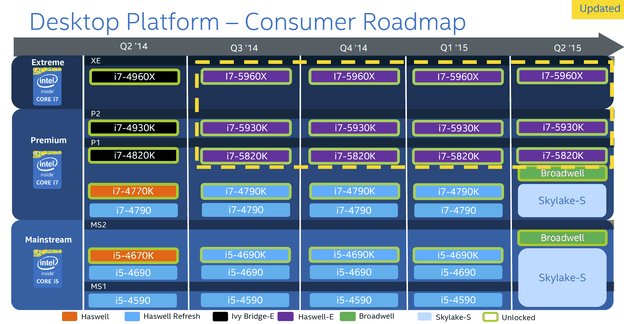 Obviously, the roadmap didn’t focus on the Broadwell-K; instead it was highlighting the upcoming Intel Haswell-E processors for the X99 platform, which is just around the corner. The upcoming Intel Broadwell-K series unlock processors will be fully compatible with the recently released Intel 9 series Z97 motherboards, like the Asus Maximus VII Z97 motherboards or the Gigabyte Z97X-Gaming G1 WIFI-BK Black Edition, since it will also be using the LGA 1150 socket and will support DDR3 memory. Speaking of memory, Broadwell will not be using DDR4, and we won’t be seeing Z97 motherboards with DDR4 memory. The upcoming Intel Broadwell-K series will feature Intel Iris Pro Graphics (either Iris Pro 5100 or 5200) which is supposed to be significantly better than the current Intel HD Graphics, and it will be based on 14nm manufacturing processor. Hopefully, Intel will do it right this time and use a good, if not better thermal interface material, like the one the used in Devil’s Canyon. At this point, we don’t have an idea about the 5th Generation processors’ naming scheme. Intel could name the Broadwell-K processors as Intel Core i7-5770K and Core i5-5670K respectively, following the naming scheme i7-4770K/i5-4670K and i7-3770K/i5-3670K. I’ll keep an eye on Broadwell-K, since I decided to skip Devil’s Canyon. Bought Haswell-E a couple weeks ago. Looks like I won’t be worrying about Broadwell for a while.